Traditionally, pineapple tarts are perfect looking little pastries but as you can see, mine aren't quite that pretty due to the fact that I didn't have a pineapple tart mold so I improvised as best as I could. Regardless of its imperfect aesthetic, they turned out to be very tasty (and family approved!) so I think I had a successful first attempt on the whole. I plan on purchasing the proper mold and re-doing them soon so I'll post new photos when I do! Adapted from Fresh From The Oven. Makes about 35 to 40 tarts. 1. 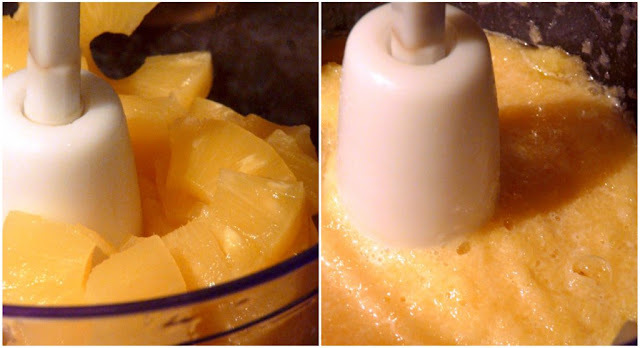 Drain the pineapple slices and squeeze out as much juice from them as possible. 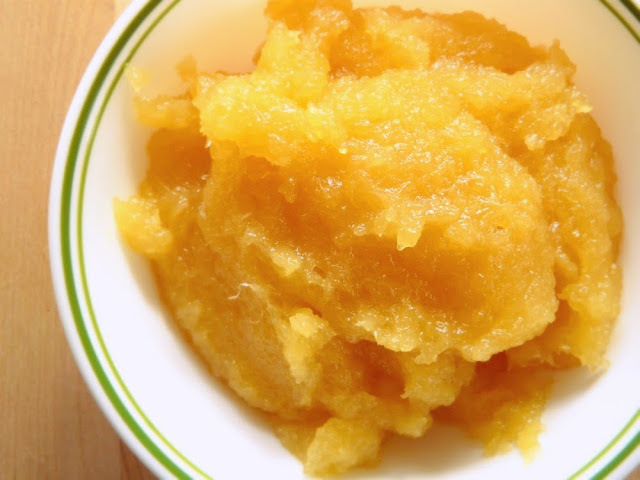 Place the slices in a food processor and puree until fine. 2. Transfer the pineapple puree to a pot and add the sugar. Bring the mixture to a boil and cook until the liquid has mostly evaporated. Add the cornstarch to further thicken. 3. The end result should be a thick and sticky pineapple jam. Set aside or place in refrigerator to allow to cool. 4. Pre-heat the oven to 350 degrees F. Sift all the dry ingredients together into a large mixing bowl. Add the beaten egg yolks and softened butter and using clean hands, mix well with the dry ingredients until you get a wet dough that comes together easily. Turn the dough out onto a lightly floured surface and knead a couple of times. Roll it into a sheet about 1/4 inch thick. 5. Using a round cookie cutter about 2-1/2 inches in size, cut out as many circles as you can. Bring the leftover dough pieces together into a ball and re-roll into another sheet and continue cutting out circles. Repeat until all the dough is used up. Using the top of a plastic bottle cap, create a smaller circular indentation in the dough by gently applying pressure and twisting it back and forth. 6. Roll the pineapple mixture into 1-inch balls then nestle them into the inner indentation. Decorate the sides using a fork then brush lightly with the egg wash. Bake for about 25 minutes until the dough is golden brown. Serve warm! My jam turned out to be a tad sticky so I couldn't roll them into perfectly round balls but in the end, no one cared.